Montessori training is a transformative journey that deepens one's understanding of the potential of children and their ability to transform the world. Dr. Maria Montessori gave special consideration to the formative psychic powers of the young child, which lead to all round development in early childhood development (ECE and ECD). This is an ideal course for those who are interested in Montessori Teaching. 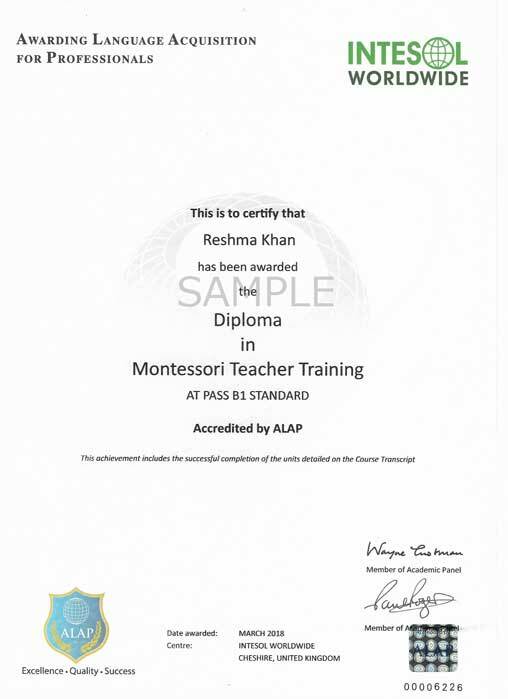 The course material is designed to understand and implement the technology of Montessori. As there is a large demand for trained Montessori in India and abroad. This course is recommended to all experienced teachers of young children who wish to gain insight into the best way to individualize their teaching curriculum, so that children of mixed abilities may work at their own pace. 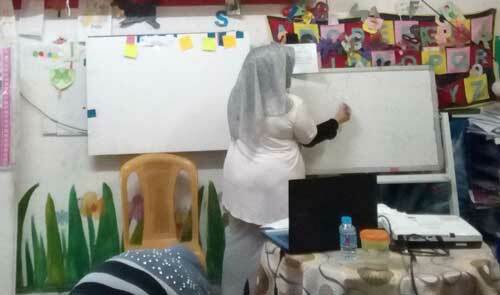 Teachers consider this course as an up-gradation, and implemented the Montessori methodology in the conventional schools. Course is mainly focused on the concepts of Montessori principles, such as 'the absorbent mind, sensitive periods and the child tendencies, the subconscious power, which guide the child in self-construction and freedom to learn on its own within a structured environment. Dr. Maria Montessori described childhood as a process in which a hidden but definite plan of nature unfolds as the child works to create the adult personality. 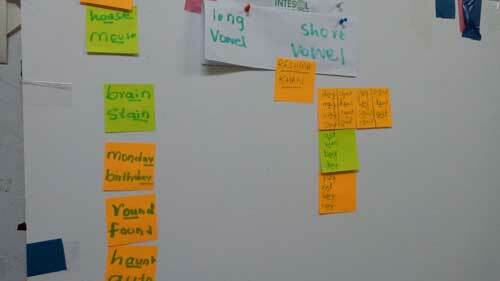 Help to arrange an cohesive and scientific environment which aids in self-learning. Allows to teach at own pace, scientific method of teaching, reality orientated and specific materials – (sense of order). Preferences on activities according to inner need of the children. Development of child-centered learning environment, self-education through self-correction methods. Recognition of sensitive periods in each child. Focus on developing the play materials for non-specific skills and multi-sensory materials to develop a specific skill. Dig up the benefits of yoga, mindfulness and nourishment in to the children. These activities are designed to help the child achieve independence and confidence through meaningful activity with real life objects; they help develop coordination, concentration, independence, hand dexterity, care of one's self and environment, patience and grace and courtesy. The sensorial material allows the child to understand his environment while learning through his senses. Each piece of material has one isolating quality, such as colour, weight, size, shape, texture, sound, smell, etc., which enables the child to take in impressions with true understanding and gives purpose, order and structure to his/her learning. The child first learns the phonetic sound of the letters, which leads to building short phonetic words, he/she progresses at his/her own pace to reading longer phonetic words and is finally introduced to the different parts of grammar. 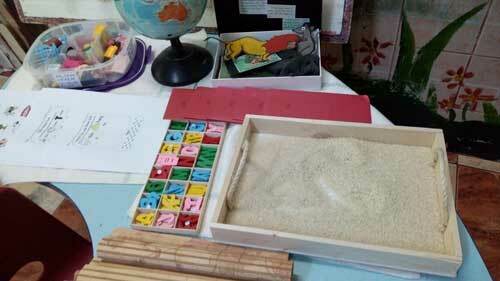 The child is introduced to Mathematics through the use of concrete materials. By working with concrete materials, the child can see and understand the operations of Addition, Multiplication, Subtraction and Division. A solid foundation is formed for Algebra and Geometry through working with concrete materials. Cultural Subjects (Geography, History, Botany, Zoology, Science, Music and Art) to help feed their imagination and understanding of the real world during the time that they are most sensitive to them, which enables them to understand their role and the fact that they are part of the whole system. Enables you to update the knowledge and skills as well as meet the professional level in Montessori field. It will assist you to be fully qualified as a Teaching Assistant or Early Years Educator. It covers all aspects of specialist support including planning the lesson, delivering, and reviewing the assessment strategies to support learning/teaching. It provides an in-depth understanding of the knowledge and skills required when working directly with children. It will make you proficient in comparing the preschool philosophies. 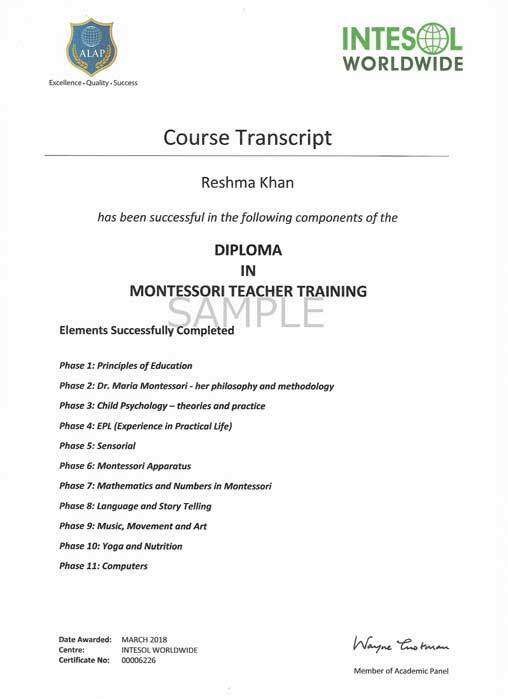 The Comprehensive Montessori Course – Post Graduate Diploma Level Introduction Even though Maria Montessori belonged to an era gone by (1870-1952), her principles are still prevalent in the present education system. The relevance of Maria Montessori’s philosophy cannot be denied in our current thinking, understanding and responses to teaching the young learners. She was indeed an unique individual- and maybe if she belonged to this era, the news media would have labeled her as someone who has the ability to think out of the box. A pioneer in enabling children learn through meaningful experience, she is an inspiration worldwide to what is popularly known as the “Montessori schools”. The course takes a comprehensive view at the Montessori Method and philosophy with an overview of its relevance and application in today’s cyber age. The course takes an overall view of the philosophy and methodologies related to early childhood education world-wide and touches upon the psychology related to early childhood, before discussing in details the various aspects of the Montessori Method. Phase 12. Methodology a. Direct/Traditional Teacher Center i) Disadvantages of traditional teacher centered approach ii) Pros and corns of traditional teacher centered approach iii) Are traditional teaching methodologies still effective?